I am a Spiritual Nomad but as I wander the rich fertile fields of Spirituality I do not wander aimlessly because I have my sights set on a deep and intimate relationship with Father God! Nothing will stop me from pursuing my nomadic life. I know Father God loves Nomads because he sent Abraham on a nomadic journey to the Promised Land. Somewhere the bible assures us that those who seek will find, to those who ask and it shall be opened up. And so I wander in the vastness the Spiritual World of God. Will I find the answer to the question that has sent me on this journey? Probably not, not because I am seeking an answer but there’s a good chance I’ll not understand it when it is presented to me but obtaining the answer isn’t the reason for my journey it’s the journey that is important. Like the song The Road to Zion says, “…it’s what’s waiting at the end. However in this case “It’s who’s waiting at the end,” in this case God. I come across this which is proving to be true in my life right now. It’s easy to thank God when he does what we want. But God doesn’t always do what we want. Ask Job. His empire collapsed, his children were killed, and what was a healthy body became a rage of boils. From whence came this torrent? From whence will come any help? Job goes straight to God and pleads his case. His head hurts. His body hurts. His heart hurts. After several dozen questions … Job has gotten the point. What is it? The point is this: God owes no one anything. No reasons. No explanations. Nothing. If he gave them, we couldn’t understand them. And so we take the first step and this journey begins. Last night I watched a movie titled 17 Miracles it was a movie centered around 500 Mormon immigrants on a trek from England to “Zion” (Salt Lake Valley, Utah). The movie not only emphasized the 17 miracles the travelers experienced on their journey it also highlighted the extreme conditions and hazards during the winter of 1856 causing the death of over 65 persons including men, women, and children. At one point the people had arrived in Nebraska and one man named, Levi Matthews who had witnessed firsthand what can happen in the harshness of winter encouraged the people not continue the trip until the following spring. However, the man in charge told the people to have faith in God and countermanded Levi and ordered the journey to continue. The starvation and death Levi Matthews described came to pass and even though there were miracles along the journey. As I watched the movie (a true story by the way) I couldn’t help but admire not only their faith in God, their faith in prayer, and their desire to live out their lives in the presence of God. Throughout the movie I found myself becoming more and more emotionally involved not only out of respect for their faith but also for the “price” faith was asking them to pay. Would I have that much faith I kept asking myself. The movie ended with giving an epitaph of some of the survivors. What really is faith, when do I exercise it, when do I not exercise it, how to do I exercise it, and how do I experience it? Even though I’ve been a Christian nearly all my life it has only been since my early 20’s I have been a serious student of faith. And like most of us (if not all) my entry into Jesus’ School of Faith was not by choice but out of necessity because it seems that once we get serious about a relationship with Jesus we find a world of opposition building against us. 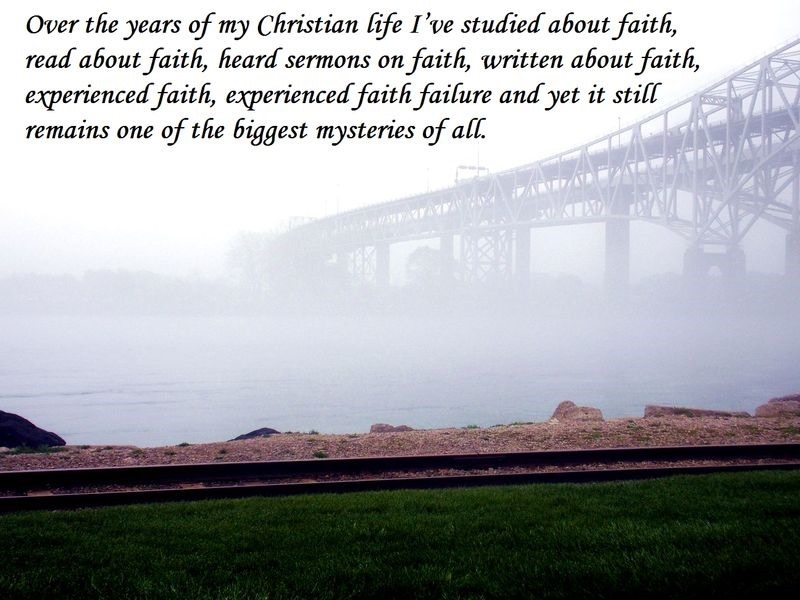 Over the years of my Christian life I’ve studied about faith, read about faith, heard sermons on faith, written about faith, experienced faith, experienced faith failure and yet it still remains one of the biggest mysteries of all. If you are familiar at all with some of my writings you know I am a survivor of Myasthenia Gravis, 14 major surgeries, several minor surgeries, a heart attack, pulmonary fibrosis, and I am a type 2 diabetic. Each of those experiences have contributed significantly to fact that I am a living witness to how powerful faith can be. Yet I don’t see myself as a faithful person. How can that be you ask? It’s really simple, whether our faith is strong or weak, seeing us to victory or seeing us to defeat depends on the person place, or thing we place our faith in. And those of us who have a relationship with Jesus know that God is the ultimate destiny for our faith. In his Letter to the Ephesian Church Paul writes, “Put on the full armor of God…” (Ephesians 6:11, HCSB) Part of the armor Paul is talking about is the “shield of faith” (verse 16) because of my life experiences and especially my experience with the medical professionals I have constructed and learned how to use “my shield of faith” quite effectively however 12 of my surgeries are a result of a mistake one doctor made and out of that one mistake and its repercussions the shield I now wield comes from God not from life and its experiences. However, there is a crack in my armor specifically in my “shield of faith” put there not by God but by the uneasiness and lack of peace in two “worlds” of my life my world of finances and my world of hopes and dreams. When either of those two “worlds” mount up an attack on me my armor is helpless to stop them. And I find myself joining the Psalmist and praying, ”LORD, I run to you for protection. Why have you turned me away? Why must enemies mistreat me and make me sad? Send your light and your truth to guide me. Let them lead me to your house on your sacred mountain.” (Psalm 43:2–3) And that brings me back to the questions asked earlier, what really is faith, when do I exercise it, when do I not exercise it, how to do I exercise it, and how do I experience it? One of the most enlightening books on faith I’ve read is R.C. Sproul’s book titled What is Faith. He begins his book by saying, “When we talk about Christianity, we are more likely to call it the “Christian faith” than the “Christian religion.” This is appropriate in that the concept of faith is fundamental to Christianity because faith is central to the biblical view of redemption. Yet faith is a many-faceted concept, so even many professing Christians struggle to understand exactly what it is.” (Emphasis mine) As you can well see I am including myself alongside the Christians who struggle to understand exactly what faith is. There is one thing I know for sure, God wants our relationship with him to be complete when it comes to our relationship with him, he wants “no stone” left unturned. The Psalmist describes God’s passion for a complete relationship with us this way. “Our God, you tested us, just as silver is tested. You trapped us in a net and gave us heavy burdens.” (Psalm 66:10–11, emphasis mine) As I begin putting together my faith puzzle I am beginning to understand that my financial woes seem to be God knocking on the door of my heart demanding financial intimacy with me. I’ve heard him knocking over and over yet for some reason it has never occurred to me to answer the door until now and with a broken spirit and a contrite heart I slowly make my way to the door. I know the first thing I need to do as the door swings open is to drop to my knees and repent of the resistance I shown toward God over the years. Lucado, M., & Gibbs, T. A. (2000). Grace for the moment: inspirational thoughts for each day of the year (p. 296). Nashville, TN: J. Countryman. Sproul, R. C. (2010). What Is Faith? (Vol. 8, p. 1). Lake Mary, FL: Reformation Trust Publishing. Sproul, R. C. (2010). What Is Faith? (Vol. 8, p. 31). Lake Mary, FL: Reformation Trust Publishing.